Electro-mechanical gun that launches rockets with a joystick control. 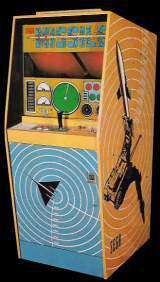 The game has electronic sound, and the fired missile can be steered by the player after it is launched by using the joystick. 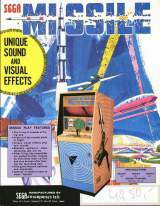 Missile uses a looping film strip to show the planes on a projection screen. The player moves a small motorized tank left and right via two buttons (left and right) which moves the motorized launcher, and then fires ahead of the incoming missiles. Once the missile is launched, the missile can be slightly steered into the oncoming planes (flight control) by moving the joystick left or right. If a plane is hit, an explosion is heard and an explosion flashes on the projection screen.